The department offers an Umbrella Program reflective of the depth and breadth of contemporary research undertaken within Chemistry and Biochemistry. The umbrella program encompasses seven different research tracks from which students can choose. The research tracks are overlapping in terms of course work and research advisors. This track draws on strong departmental expertise in both theoretical and experimental physical chemistry, with specific application to atmospheric chemistry. The varied use of analytical and computational techniques, ranging from molecular dynamics simulations to mass spectrometric analytical methods, results in significant collaborative efforts with other tracks within the department and beyond. The newly formed NSF sponsored Chemical Center for Innovation, Center for Aerosol Impacts on Climate and the Environment, provides unparalleled research and teaching opportunities for graduate students. This track draws on exciting recent strengths in the department aimed at using molecular techniques to study or to create new function in biological systems. This highly interdisciplinary field includes faculty from organic chemistry, inorganic chemistry and many other departmental tracks, and often involves collaborations with faculty in the departments of Biology and Bioengineering, as well as within the Skaggs School of Pharmacy and Pharmaceutical Sciences and the School of Medicine. This track draws on diverse strengths in many areas of Inorganic Chemistry including: nano-materials synthesis and characterization, energy conversion and storage, bioinorganic and biomimetic chemistry, organometallic synthesis, catalysis, structure determination, magnetic materials development, spectroscopy and sensor design. Groups in this track are multi-disciplinary and utilize several departmental and campus-wide analytical facilities for characterization and fabrication of materials. Elements of the inorganic track are also heavily invested in the newly formed Department of Energy (DOE) "Solar Energy to Liquid Fuels" Hub initiative. This $125 million per year collaborative program brings together top-rate scientists from several California institutions to develop the next generation of energy technology and offers an unparalleled opportunity for students interested in cutting-edge energy research. This track represents a broad spectrum of traditional and emerging areas of chemistry involving the synthesis and study of small and large carbon-based molecules. 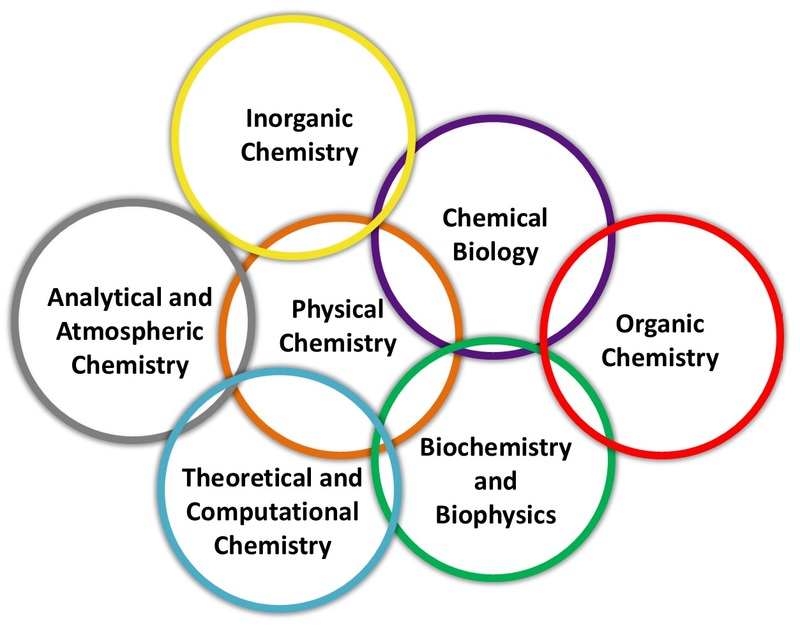 The enormously diverse applications of artificial and natural organic compounds creates strong interdisciplinary efforts in organometallic, physical organic, materials, bioorganic, and natural products chemistry. Many research programs have significant overlap with Chemical Biology, Molecular Biochemistry and many other tracks, as well as efforts within the Skaggs School of Pharmacy and Pharmaceutical Sciences and the Scripps Institute of Oceanography. This track draws on a strong interplay between theory and experiment in traditional and emerging areas of physical chemistry. More specifically, spectroscopy and microscopy techniques are developed and applied to elucidate molecular mechanisms related to biophysical, medical, materials, reactive kinetics and alternative energy research. Theoretical and computational methodologies are developed to address a broad range of problems related to protein folding, drug design, nonequilibrium statistical mechanics, molecular simulations in the condensed phase and molecular electronics. Many research programs have significant overlap with Structural Biology and Biophysics, Chemical Biology and Analytical and Atmospheric Chemistry tracks. This track emphasizes the development of new theoretical methods and simulation approaches for application to current chemistry and biochemistry problems. Over the past decade, theoretical chemistry and computational chemistry have undergone a revolution triggered by the advent of new theories/algorithms and high-performance supercomputers, making possible the study of increasingly large and complex systems. Current research at UCSD covers a broad range of topics that include quantum-mechanical methodologies for energy and electron transport, non-equilibrium statistical mechanics, theoretical and computational approaches for biomolecular simulations, drug discovery, protein-protein interaction networks, carbon capture and hydrogen storage in porous materials, theoretical geochemistry, computational modeling of heterogeneous chemistry relevant to climate and the environment, electronic structure calculations of inorganic and organometallic complexes, and magnetic and transport properties of metal-organic frameworks.